Carl Benjamin Jackson was born in Starke, Florida on January 9, 1930 to Annie Lee Paige and Ernest Jackson; both preceded him in death. One brother, Willie Lee (Billy) Clark and a sister, Dorothy Allen also preceded him in death. Carl spent his childhood between White Springs, Lake City and Jacksonville Beach. He attended school in Jacksonville Beach. He had six children, three of which preceded him in death, Ernest B. Jackson, Carlean Woodward and Bernard R. Jackson. He was employed by B. B. McCormick & Sons Inc. for many years and retired as a supervisor. He had an exceptional memory and loved history. He spent his past time reminiscing with friends, staying abreast of current political news, reading, and watching the history channel. You could always depend on him to be informed and have a perspective on current events. 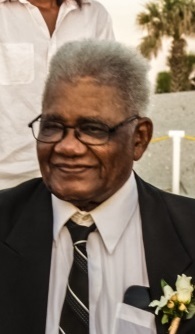 He leaves to cherish his memories, a brother, Albert Johnson (Gwen); three daughters, Connie Barrett of Jacksonville, FL, Carla Jesse (Sherman) of Jacksonville, FL and Dorothy Calhoun of Valdosta, GA; and a host of grandchildren, nieces, nephews, cousins, other relatives, and many friends. Special thanks to nephew, Jeffery Clark (Camellia) of Jacksonville Beach, FL; grandsons, Roy Barrett (Krystal) of Atlanta, GA, Hannibal Shakur (Lakiesha) of Jacksonville, FL; and a life-long friend, Raymond Campbell of Jacksonville, FL.